Who Will Dominate the CRISPR Arms Race? It’s a popular meme that a China unencumbered by Judeo-Christian morality/superstitions (cross out as appropriate) will be more open to transhumanist technology. On Sunday, the Shenzhen City Medical Ethics Expert Board said it would begin an investigation of He’s research and released a statement saying that HorMoniCare “according to our findings … never conducted the appropriate reporting according to requirements.” The former medical director of the private hospital, Jiang Su-Qi, told Southern Capital News, he had no recollection of approving He’s research while he was on its ethics committee. “These two children are the guinea pigs. They will go through their whole maturing process having not understood the risks ahead of time,” said Liu Yan of Peking University Molecular Medicine Research Center. A 2003 guidance to Chinese IVF clinics prohibits the transfer of genetically-modified embryos to start a pregnancy. He’s American media spokesman, Ryan Ferrell, did not respond to questions about the legality of the project. In reality, I’m not 100% sure this stereotype is merited. 1. The original Tech Review report contains to a link to a recent poll commissioned by the Global Times, which shows that Chinese support for genetic tinkering is remarkably similar to American numbers. About 62% of Chinese support genetic edits to children likely to develop a fatal genetic disease, versus 60% of Americans who would change a baby’s genes to reduce of the risk of a serious disease that could occur over the child’s life. However, only about 23% of Chinese would support gene editing for improving intelligence, versus 19% of Americans. For all intents and purposes, these numbers are identical, so contrary to previous thinking, we can no longer expect Chinese public opinion to push us towards CRISPR-transhumanism. Ultimately, it will be entirely up to the CPC. 2. 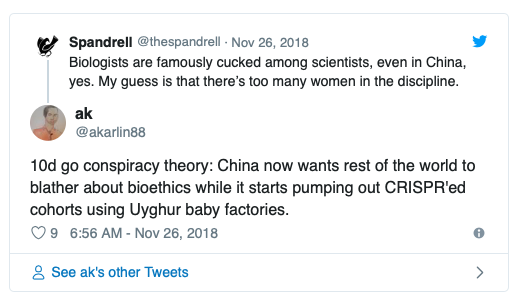 China actually bans human germline modification, though only at the level of guidelines, not legislation, as in Europe and the Anglosphere minus USA. The US situation is a regulatory morass, but formally speaking, it is freer than China. Funnily enough, of the major countries, only Russia has an “ambiguous” position (though I suspect largely on account of nobody having thought about it yet, considering its extremely weak position in the bioscience sector). 3. You may be surprised by this, but despite the weekly SJW scandals, there is greater acceptance of evolutionary approaches to human behavior amongst North American social scientists and anthropologists than in any other region of the planet apart from Australasia. In fairness, East Asians also do pretty well by global standards. There is lower acceptance of it in Eastern Europe (Lysenkoism dies hard), and extremely low acceptance in the Middle East (figures). This may perhaps also be taken as a sort of proxy on how open the scientific establishments in various countries will be to things like CRISPR babies. Anyway, what I’m saying is, one shouldn’t necessarily expect the biosingularity to originate in East Asia. While before I thought China had much better prospects than the US, now I rate them about equally. If some kind of global moratorium goes ahead, the chances of seeing a biosingularity happen will obviously fall. This introduces some interesting considerations. (1) Defections. I have often noted that any country that started genetic editing for IQ at a sufficiently mass level could gain a massive strategic advantage, even if it only managed to keep the program under wraps for a few years while the other countries debate bioethics. This strategic advantage will come by dint of the extremely unbalanced positive effects on economic dynamism and scientific productivity of “smart fractions.” Inject one or two orders of magnitude more of them into the labor pool a decade or two in advance of the rest of the world and you could develop a near insurmountable lead, like Britain did after the Industrial Revolution. Incidentally, it also strikes me that China is the only country that might feasibly have some chance of pulling off a defection/deception operation. Those concentration camps in Xinjiang may yet come in handy. (2) AI. If there are no defections, the only transformational scenario left open would be machine superintelligence. This is probably riskier than a biosingularity (and not just on account of the usual “Skynet” reasons). (3) Dysgenic collapse. It’s entirely possible that machine superintelligence doesn’t pan out either, and with the prospect of a biosingularity likewise cut off, the dysgenic trend becomes dominant and we head towards the Age of Malthusian Industrialism.